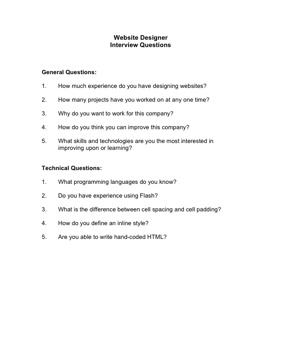 Choose your next Website Designer with the aid of these helpful interview questions. 1. How much experience do you have designing websites? 3. Why do you want to work for this company? 4. How do you think you can improve this company? 5. What skills and technologies are you the most interested in improving upon or learning? 1. What programming languages do you know? 2. Do you have experience using Flash? 3. What is the difference between cell spacing and cell padding? 4. How do you define an inline style? 5. Are you able to write hand-coded HTML?